These go by many names, the least offensive is Beer-garitas. 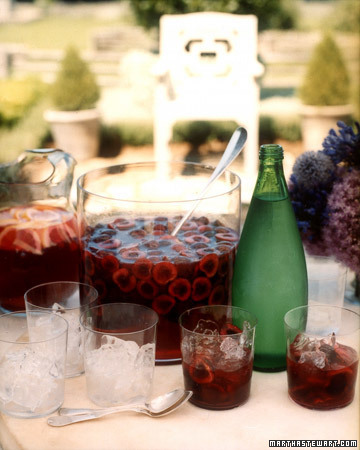 The inexpensive bulk way of making these cocktails is perfect for a party. Mix it all together. Don’t dilute the concentrate – the beer will do that. Serve over ice with a garnish of lime. Martha's Bing Cherry Mojitos - cherries are starting to come into season (not quite yet in Washington) and would be great this weekend! And don't forget a few non-alcholic options to re-hydrate! Freeze watermelon and use it as ice cubes in a giant pitcher of water.